← What If? Rejects #7.3: Nuke It From Orbit! 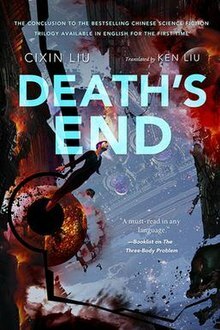 Death’s End is the final installment of the Remembrance of Earth’s Past trilogy by Liu Cixin (family name Liu), the most popular science fiction series in China. I’ve reviewed the first two books before: The Three-Body Problem and The Dark Forest. The third book came out in translation last year, but I’ve finally had the time to read and review it. Unfortunately, Death’s End is not as good as the brilliant story that was The Dark Forest, or even as good as The Three-Body Problem. It’s a good read, but it has several problems that detracted from the story for me, and it was not as satisfying as the first two books. At first glance, Death’s End seems almost unnecessary. The Dark Forest ended with a perfectly satisfying conclusion, on the face of it. But there was one loose thread I noticed, which at the time I had thought was a plot hole, but was actually key to understanding Death’s End: if the distrust between civilizations that leads them to blindly attack each other is caused by a lack of communication, and if it’s so easy to set up real-time communication via sophons (subatomic particles turned into quantum computers), why is there a problem in the first place? The answer—or part of the answer—is that sophons don’t work everywhere in space, and in fact, they can be blocked with appropriate technology. And there are also other, more dangerous weapons out there—things that can change the very nature of space itself—and fittingly, they are things that were foreshadowed all the way back in The Three-Body Problem with the technology to unfold the string-theory structure of a proton into lower dimensions. In the end, the universe is a lot colder and darker than we thought. And there’s one other menace, too. In The Dark Forest, humans beat the Trisolaran menace through deception, which the aliens lacked in their psyche, but now, they’ve learned…and they’ve bettered the instruction. A recurring theme of the book, and indeed the entire trilogy, is isolation. Trade can exist between civilizations in the universe, but both people and planets are fundamentally isolated from each other in the end. The inevitable conflict over limited resources will always drive them to stab their allies in the back. The other theme of the series is one of difficult moral choices, together with their relationship to human love. This includes romantic love, familial love, and general love of mankind, but one of the most notable impacts it has on the story is that it ultimately leads to humanity’s downfall. This was where it started to go off the rails for me. On multiple occasions throughout the trilogy, humanity makes strategically terrible decisions because the “correct” decision is seen as inexcusably immoral. Most egregiously, at the beginning of The Dark Forest, when the alien invasion is first announced, the policy of “escapism”—building interstellar spaceships for some people to escape from Earth—is made illegal as a crime against humanity because most people would have to be left behind, and it would be immoral to select a small fraction of humanity, probably strongly biased towards the wealthy, to be able to survive. Meanwhile, the people who actually have to make the tough choices go from being lauded as heroes to condemned as murderers worthy of death and back again multiple times by a fickle public as fortunes shift. Either way, as an American reader, this is absolutely absurd and a tiny bit worrying. I can’t imagine the United States ever going along with that sort of ruling without China explicitly threatening war over it. Partly, this is because of our peculiar American dedication to rugged individualism, where anyone who is able to escape should be allowed to do so, but it goes deeper than that. The Biblical story of Noah’s Ark, with a small remnant being selected by God to survive a catastrophe and preserve humanity, is so deeply ingrained in Western culture that it is probably the automatic response of anyone who grew up in an Abrahamic faith. Any disaster movie made in this country will tell you this, which is one more reason I’m so confident in this conclusion. But for all this, I tried to accept this as a cultural difference and the story as one that was presumably well-received by its intended audience, and I was still able to get into it and enjoy the story—that is, until the very end. The ending…I had real trouble with it. Part of this is again cultural, I think. In my experience, Americans are suckers for happy endings, while I tend to get the impression that foreign authors (and not just those in China) are a little freer with stories that are bittersweet, ambiguous, or just plain tragic, and Death’s End definitely leans towards tragic. I can accept the destruction of the Solar System and most of the human race as the tragic final chapter of humanity’s own morals being our undoing in a cold and unfeeling universe. The fate that befalls the main characters, however, seemed unnecessary—more of a contrived way to keep them apart when there should have been no obstacle to them being together (in one case, literally 15 pages after they became romantically interested in each other). Even though it’s in keeping with the theme foreshadowed long earlier of lovers (and worlds) fated to be eternally separated, it still feels like the author is taking it a little too far after already destroying the Earth. All in all, this was a good book, a brilliantly constructed work of storytelling with multiple mysteries as convoluted as those in The Dark Forest and just as entertaining to try to solve, as well as an equally deep window into the Chinese culture that produced it as the first two book. But in the end, I feel that it is the weak point of the trilogy, and it would have been better with some significant changes. Nonetheless, it completes the series in an elegantly tragic way and is still worth the read. This entry was posted in Book reviews and tagged Death's End, Liu Cixin, Rememberance of Earth's Past, The Three-Body Problem. Bookmark the permalink.